This long weekend I would try my best to update my blog. Here is post #1 for a pair of pillows I made for my friends, Jamie & Marvin, exclusively for their wedding on July 12, 2014. 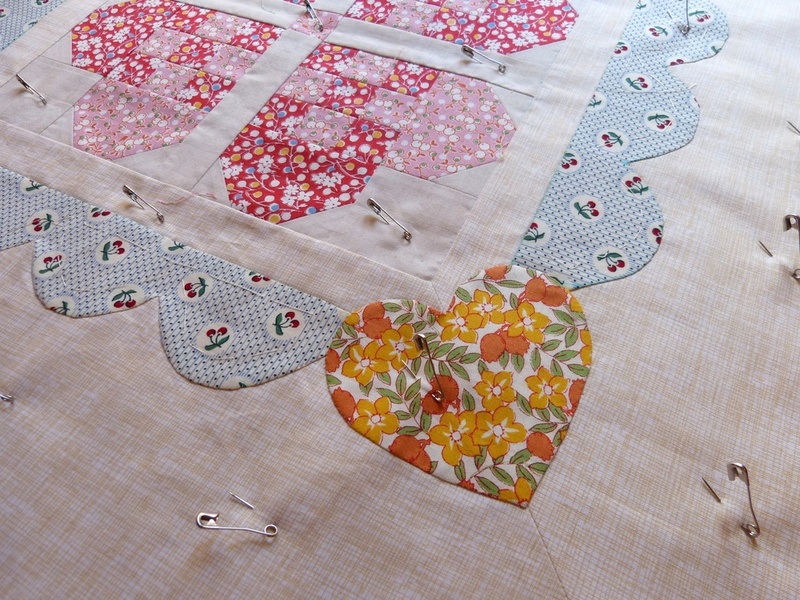 It's all about hearts: appliquéd hearts, patched hearts and quilted hearts. One is in pink, for Jamie; and other in green, for Marvin (he adores everything green). They have been together for 10+ years, ever since Grade 12! The pink one has the appliquéd hearts hand stitched using the needle turn technique. But the green one is machine appliquéd. It's simply because I ran out of time due to all the hiccups encountered in the past months. Though machine appliquéd, it's by no means poorly finished! 1. The way that I made the zippers exposed is just inappropriate. I should definitely not use this particular zipper installing method for pillows next time. I don't want anyone get scratched. 2. I made the scallops a bit too deep, are they? The scallop shape is from the outer curve of a cable stencil. Next time, I should slightly adjust the curvature to be more shallow. The pillows have definitely a 30s looks because of the retro fabrics used. I like the hint of nostalgia, the reminiscence of our great grandparents generations and their austere but joyful lives.